Rob Brown calls for the creation of a Museum of Migrants in Glasgow to remember all those, like the victims of the Irish potato famine, forced to flee to other shores. Jinty McGuinty’s will be jumping and Waxy O’Connor’s will be filled with wild revelry. But, yet again, you won’t find Guinness-fueled leprechauns dancing down Sauchiehall Street in a big, swaggering St. Patrick’s Day parade, as they do on Fifth Avenue and other central boulevards all over the globe. Clydeside isn’t New York or any of the other shimmering metropoles where all sorts of tricolour-waving antics are not only tolerated but universally smiled upon. Mother Glasgow isn’t just nestling the Billy and the Tim, all too often she’s got to wrestle them apart and confiscate their lethal weapons. So if there is a certain nervousness in the marbled corridors of power in George Square about giving the go ahead to a great annual flaunting of Irishness, that’s perfectly understandable (if not entirely excusable). But if campaigners for St Patrick are keen to demonstrate true solidarity with the Glaswegian proletariat of Irish ancestry, they’d do better for now to stop banging on about a St Paddy’s Day parade and commit some time to commemorating Paddy’s Market. Almost exactly a decade ago, a decision was taken by Glasgow City Council to shut down one of the oldest and most popular sites of common exchange on these islands. A colourful and characterful slice of the city’s heritage dating back to around 1847, it was suddenly wiped off the city map after being declared a “crime-ridden midden”. The shell-shocked stallholders were ordered abruptly to pack up their wares and clear the way for the realisation of a new visionary project aimed at ‘revitalising’ the area through the creation of an artist colony and a more upmarket shopping destination occupied by “legitimate traders”. Tucked in a lane between the city centre and River Clyde, Paddy’s Market was a true Glaswegian institution, spontaneously created nearly two centuries back to serve a vital social need among Irish immigrants who had fled the potato famine – providing the necessities of life at the lowest prices for those trapped in poverty. Alright, it was a bit anarchic with second-hand fur coats, mismatched shoes and furniture strewn along rickety tables and camp-beds. But, as a fifth-generation hawker told a reporter from the Guardian dispatched to chronicle its hasty demise, that had always been part of its appeal. The scandalous proliferation of food banks across the Clydeside conurbation – and all over the country – during the last decade has provided ample confirmation of that statement. 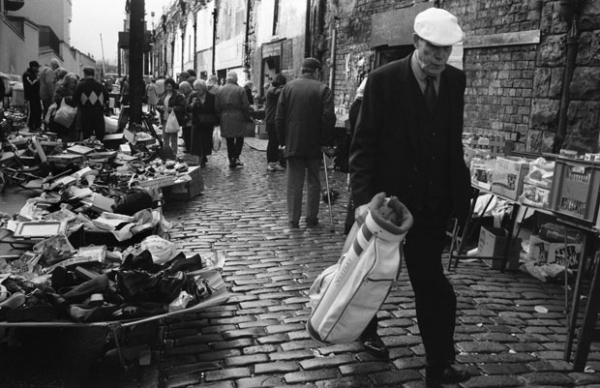 That social crisis won’t be solved by commemorating – or even recreating – Paddy’s Market. But a real sustained sense of solidarity among Glasgow’s citizenry might be engendered by creating an attractive visitor destination dedicated to all migrants forced by destitution to flee to Scotland’s commercial capital. These include the Protestant poor as well as the Catholic poor from the north of Ireland. The Great Hunger did not discriminate. An Gorta Mór drove hundreds of thousands – drawn from both communities – to clamber aboard the emigrant boat to Glasgow. Abject poverty, along with plagues of cholera, typhus and dysentery, struck like the four horsemen of the apocalypse as the potato blight swept through the whole province of Ulster. In fact, it has been estimated that a full-third of those who sought refuge in Scotland in that cataclysmic period were Protestant. Four years ago, a remarkable cross-community project was established in Northern Ireland to shatter myths and develop deep awareness about the shadow cast by the famine across the entire north of Ireland – not just Donegal. Sharing the Past enabled community groups to hear of harrowing stories learn about the suffering of their tragic ancestors in Loyalist strongholds such as Larne and the Shankill. Community groups were even enabled to walk through old workhouses and sites on both sides of the Border. Backed by a grant from Heritage Lottery Fund, the project – driven from the grassroots up – set out to publish a series of small educational booklets and stage an exhibition on the famine. But wouldn’t it be marvellous if a far more ambitious educational facility of this sort could be founded and funded on a permanent basis in the city that offered refuge to so many victims of ‘Ireland’s Holocaust’? Hopefully, it would be widely attended by many well-heeled visitors from the Republic of Ireland, all too many of whom casually disremembered their country’s tragic past and its diaspora when the Celtic Tiger purred. Featuring strongly among what were dubbed the ‘Forgotten Irish’ in an RTE documentary were all those desperate migrants to the west of Scotland. Nothing illustrated that more than the demolition of Paddy’s Market, which was completely ignored by the Irish media. (I can testify to that because I was based in Dublin at the time and tried in vain to pitch the story to virtually every media outlet). Back in 2009, Paddy’s stallholders campaigned to the council to turn it into a tourist attraction – a documented piece of Glasgow history much like the Barras Market nearby. But the lane from which the powerless stallholders were forcibly evicted has lain empty for almost a decade. Glasgow could generate massive amounts of global attention – and make a much-needed statement to the world in these turbulent times – if it were to create a Museum of Migrants. Even better if this grand project were located on – or in close proximity to – the site of Paddy’s Market. If that truly pioneering facility fulfilled its fabulous educational potential, the city council might even one day feel perfectly relaxed about sanctioning the first ever St Paddy’s Day parade down Sauchiehall Street. 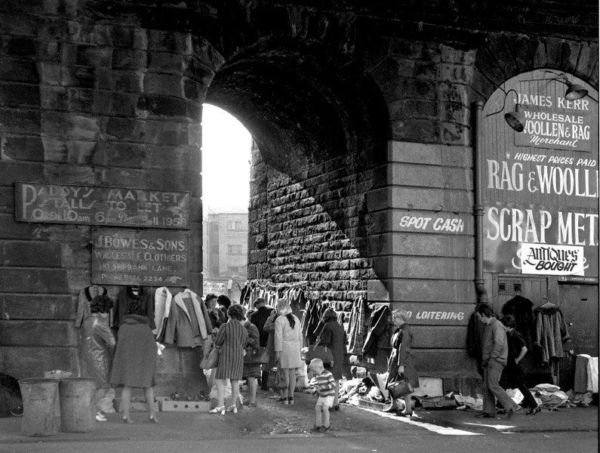 I remember Paddy’s Market, not as a part of Glasgow’s Irish history but as a place my mum took me in the 50’s and 60’s to buy food from one of the arcade shops. It was also where my clothes came from in our very poor days. It was of necessity. I was a child of two very hard working parents who did not get paid very much money. (I do not say ‘earn’ much – they earned every penny.) Although at the time of its closure I was fortunate enough not to need to use it, I knew people who still went there for necessities. The fact that it still lies derelict is a scandal directly attributable to the Glasgow Council of the day. Sorry to hear of your suffering – which is (and always has been) all too common in our country. Poverty hasn’t just persisted in the west of Scotland and the rest of this septic isle. It has been skilfully and systematically perpetuated down the centuries by those who lord over us. But we must do everything to resist their customary divide and rule tactic. One way is to educate the public about how they have done that in the past and to celebrate immigration. A Museum of Migration in Glasgow is my own modest proposal to contribute to that vital cause. A ”St Paddy’s Day parade down Sauchiehall Street ” – really ? I can imagine the bilious reaction that might engender among our Orange Marching ‘brothers ‘ who would not see the hypocrisy in their opposition to such an event . this, as on everything, can be shifted over time by education and the media – as well as by those other potential public educators. Otherwise, I wouldn’t have devoted my entire working life to those sectors. the public sphere – which can be anyone in the Internet age. The discussion we’re having right now on this forum is an excellent example of that. being sent ‘to Hell or to Connaught’, in the words attributed to Cromwell. Their crime was their religion. As the novelist Colm Toibin outlined in his 1999 book on The Great Famine, this discrimination also took place in overwhelmingly Catholic areas such as his home town of Enniscorthy. Some groups perished, while others did not. The result was a reluctance of Irish historians to write about the famine. This lasted well into the second half of the 20th century. Also, Glasgow may have been the city that ‘offered refuge’ but it was also a city where they were discriminated against for well over a century after they arrived. Rob Brown will be well aware of Arnold Kemp’s comment that he would not have been made editor of the Glasgow Herald in 1981 had he been a Catholic. That was in 1981. Rob Brown writes that a third of those leaving Ireland for Scotland at that time were Protestants. What is the basis for this assertion ? Having immersed myself in Irish history since I first got hooked in my first year at Glasgow Uni by Robert Kee’s Ireland – A Television History, I am well aware of the story of suffering and oppression to which you refer. I am also well aware of Arnold’s experience. But he was able to talk and write about the atavistic prejudice he brushed up against when he was poached from The Scotsman because it had evaporated at Albion Street well before the end of his editorship, certainly in the newsroom. And Arnie was instrumental in bringing that about. Massive progress has been made to remove (or at least significantly reduce) the stain of sectarianism on Scottish life in my lifetime and will continue to be made through all forms of public education – including this splendid forum. The author’s assertion that about a third of the famine and post-famine Irish immigrants were Protestant is based on numerous academic books/articles which have been produced on Irish immigration to Scotland, which assert that between a quarter and a third of Irish immigrants were Protestant. Prof. Graham Walker of Queen’s University, Belfast and Elaine McFarland among many others have written on this subject, Prof Walker having produced one particularly interesting article on poor Irish-Protestants in Glasgow. Where do you think the Orange Order in Scotland comes from? It wasn’t some spontaneous reaction by Scottish Protestants to Irish Catholic immigration, it was brought to Scotland by Irish Protestants and was always strongest in areas of heavy Irish Protestant settlement, Partick being a case in point, having had the highest concentration of Irish Protestants on Clydeside. I’m currently reading a 2008 publication, “New Perspectives on the Irish in Scotland,” edited by Martin J. Mitchell, which includes chapters on Irish migrants in the Scottish Episcopal Church, Sectarianism, Segregation and politics on Clydeside (Govan and Kinning Park) in the later 19th Century, with reference to Irish Catholic and Protestant migration to these areas and the Orange Order since 1860. The chapter on the O.O., authored by Eric Kaufmann of the University of London concludes that “the Order’s growth was fueled by Irish-Protestant immigrants and their descendants and is currently strongest in areas of historic Irish Protestant immigration.” Just as Celtic football club adopted some of the symbolism and songbook of Irish Nationalist/Republican culture, so it was inevitable that, in opposition to Celtic, Rangers football club would adopt some of the symbolism and songbook of Irish Unionist/Orange culture. This wasn’t the sudden result of a migration of shipyard workers in the second decade of the 20th century. Irish Catholics and Protestants had been migrating to Scotland for over a century, bringing their sectarian rivalry with them, with that rivalry eventually manifesting itself in the rivalry between Scotland’s biggest football clubs. On the question of the lack of a St. Patrick’s Day parade in Glasgow, I agree with the author that some kind of immigration heritage centre would be preferable. Parades are of their nature ephemeral events and are often accompanied by a considerable amount of drunken, anti-social behaviour. St. Patrick’s Day parades are essentially an American invention, imported into Ireland in the relatively recent past and providing an excuse for a monumental piss-up, they don’t have much native historical provenance. I live in Northern Ireland and when I was growing up the only processions were mostly of a religious nature, organised by either the Catholic or Episcopalian churches, with a few parades organised by the Ancient Order of Hibernians on the one side, or the Orange Order on the other. Thanks for your response. I remain very sceptical of the claim that a third of Irish immigrants to Scotland were Protestants. Tom Devine, in The Scottish Nation (page 487) puts the figure at ‘about a quarter to a fifth’. There is no explanation as to how this figure is arrived at. Steve Bruce in his book, ‘No Pope of Rome’ (page 28 ) simply says that ‘some were Protestants from Ulster.’ This last comment does not suggest a large percentage. You ask, ‘where do you think the Orange Order in Scotland comes from ?’ Plainly, its origins are in Ireland. However, it took root here because of Scotland’s fertile anti-Catholic soil. It has been claimed that Glasgow in the 1790s had more anti-Catholic societies (43) than Catholics (39). At the time of Catholic Emancipation, there were anti-Catholic riots in Perth, Inverness and Edinburgh. This home grown anti-Catholicism – which has been well documented – survived well in the second half of the 20th century. Anti-Catholicism in Scotland was not the creation in incomers. Tom Devine puts it lower; 20% to 25%. Rob Brown is confident it was fully a third. My feeling is that there IS insufficient evidence at present. James E Handley, who wrote more about the Irish in Scotland than any other historian, barely mentions this group. Although he wrote from a Catholic perspective, he was a serious historian. I do not doubt that there was significant immigration by Protestants from Ireland. However, 15% would be significant. My instinct is that, if this group had been as large as is being claimed, it would have left a bigger historical footprint than seems to have been the case. Thank you, William. Couldn’t have put it better myself! It is something that Scotland has to come to terms with to become a grown up country: Scots-Irish identity. There are too many still who are happy to celebrate diversity with Pakistani Scots, Indian Scots yet denigrate as ‘plastic paddies’ those who want to hold on to their Irish heritage. A museum of immigration (and emigration?) would be a good idea. On a related note, with independence, we will also have to deal maturely with the presence of the large number of Scots who identify as British. If we want independence to work, we need a satisfactory answer to the question: what will it mean to be British in an independent Scotland? I abhor the term ‘plastic paddies’ as much as you do, Craig. As for how diehard Unionists might feel post-independence, I believe one of the first priorities (indeed duties) of the first Prime Minister of Scotland should be to make everyone living within our national boundaries feel no less patriotic and no less valued than those who were in the vanguard of the struggle for the restoration of Scotland’s ancient national sovereignty. If some of them continue to identify as British, well so be it. They can always nurse their nostalgia by going on weekend visits to the Museum of Great British Political History at Westminister! It’s a sad fact that almost any expression of Irish cultural affinity or identity is perceived in Scotland as to be a sectarian gesture…. the Irish tricolour is not perceived by a big chunk of Scottish society to be just another flag, like the Stars and Stripes, say, or the Canadian flag…. …this, despite the orange in the Irish tricolour being there to recognize Ireland’s protestant tradition along with the green which represents its catholic tradition. The reason I think that so many Scots of Irish Catholic descent invest so much passion and energy and money into a team as bad as Celtic FC is because it is the only means of culturally expressing their collective sense of identity which has traditionally been open to them in Scottish society. You know, all this talk about taking Irish politics out Scottish fitba is fine, but you would need to create other avenues or venues for that sense of cultural identity to flourish. As far I can recall, there was a lot of Irish protestant immigration to Scotland, but a lot of these people were skilled immigrants working in the shipyards. When Irvine Welsh says that both Celtic and Rangers have equally invested in sectarianism, I can’t say I can agree with him apportioning equal blame. It’s a totally naive comment at best. This is, of course, true. It is worth asking, did Catholics in Scotland of Irish descent, ever want such a parade ? I would say; no. Further, that Catholics in Scotland viewed St Patrick’s Day parades, such as those in New York, as essentially commercial and bogus. With regard to the absence of an apology for discrimination, I would argue that such declarations are pointless since those making the apology are not those who discriminated and those receiving the apology are not those who were discriminated against. It would be worthwhile – and this would apply to Scotland’s involvement in the slave trade – if present day Scots, realizing how flawed their ancestors were, showed a little more humility and were less eager to denounce those whom they view as moral failures. Well, you’re right Florian in the sense that nobody would have ever really thought about a St Patrick’s Day parade until what, ten or twenty years ago? I mean it would just have been considered a daft idea. But now, with everything being commercialized, with “special days” being created for this, that and the next thing- and of course it’s all about money, getting people out the house and into the pub or a shop – you would have thought a St Patrick’s day parade in Glasgow would have happened maybe. As for the State, discrimination and the Famine, please note my choice of words in the text above Florian. I did not use the word “apology”, I wrote “acknowledgement”. The State almost never apologizes, because an apology would leave it open to legal redress. It’s about being included in the official narrative. For people who feel a sense of grievance and loss – not so much in Glasgow today compared, say, to a human rights tragedy in the Balkans 30 years ago – a recognition of their suffering and loss is important to their psychological recovery. So an acknowledgement is a symbolic gesture, but symbolic gestures are very important in democracy. They can change perceptions and boost the confidence of minority communities. My guess is that there are still a fairly large number of Scots of Irish Catholic descent who feel deep mistrust and suspicion of Establishment Scotland and its attitude to them. And with good reason. You are, of course, correct. You did not use the word apology. My mistake. Sorry. Having grown up in a 100% Irish Catholic family in Scotland, I know of no Catholics who care about ‘the official narrative.’ They know that they were discriminated against. They also know that they were better off in Scotland – even with its employment discrimination – than they would have been had they stayed in Ireland. The fact that so many Catholics voted for independence in 2014 demonstrates that most of them are at ease with Establishment Scotland. They are now part of it. Rather than look back at past injustices, the Scottish left might look at present injustices which it could act to alleviate. My starting point would be ‘Educational Apartheid’ which has developed in state schools since comprehensivization in the 1960s. I mean, how can there be Orange marches in the west coast of Scotland, but there can’t be a St Patrick Day parade? You need to ask these questions if you want to build a new country. And Alan captures very well the mood of bus journey down to that terrible game Rangers played in Manchester…. And he’s also a big Scottish independence supporter. So maybe Alan’s got some answers, though it’s a very hard question. As ever, you make a lot of good points, red gauntlet. As for Alan Bissett supporting Rangers, I reckon he’s far from being the only highly educated and enlightened Scot who does that. But it would be fascinating to hear his views on how many more of his fellow Gers fans might be converted to the independence cause. Good article and good questions raised Rob. I’m enjoying your articles; insightful, challenging and a healthy, irreverent approach to the powers that be. There are so many things we don’t do, cannae do in this country (Scotland) because they challenge establishment interests or our own view of ourselves. It raises a question for me: How do we become a country run for the benefit of ordinary people, as if people actually matter? If Scotland ever votes for independence, there may be a temporary power vacuum created. How do we, ordinary folks, make sure that we don’t swap one set of London-based elites for another set of Edinburgh-based ones? How do we actually get control of our ane country & resources and run things to suit us, rather than big business, big money? Maybe we can’t, maybe the only game on town now is a neo-liberalist, low wage, consumer economy? Maybe any country attempting a fairer approach, which insists on big business paying a fair tax and fair wage, in exchange for access to the market, will be attacked (Venezuela & Greece style) until it falls into step? Where does our power lie as ordinary Scots? What is our lever? Thanks for your kind compliment, Wull. As for how we forge a progressive nation on a largely neoliberal planet, I believe one way we do that is through serious pre-independence discussions and consciousness-raising on platforms such as this site. Don’t despair. Debate! When I am First Minister ( how you all wish ) I’m going to ban the word establishment. The law will already be there for me to do it.It’s a hate word with no real meaning. Are there people in positions of power in Scotland connected by class and culture and institutions? Sure; Nicola Sturgeon, Mike Russell, Hugh Kerr, Magnus Linklater, Murray Grigor, Sally Magnusson, Leslie Riddoch, all connected through institutions and positions of power…God knows what class means these days. Can you be in an upper class if you live in Easterhouse? A lower one if you live in Murrayfield. The word Establishment is often used as an excuse for injustice, some mysterious group that pulls the strings. They don’t exist. I know. I don’t deny that there are wealthy and powerful people in the land who control a great deal, and shouldn’t. Or that public school education restricts social mobility, but this word ” Establishment.” is over used and often a hindrance to fighting the real enemies. I don’t understand the distinction you’re making Max between “wealthy and powerful people in the land who control a great deal, and shouldn’t” and The Establishment? Mike, I don’t deny that there are many people who have either been brought into the world inheriting huge sums of money and thus power or who have acquired power through the contacts and the better education ( well sort of ) gained in private schools, my point is that there is also a fantasy that there is this tiny elite who wear top hats ( well sort of ) and who control almost everything. This irrational belief can give us the excuse to just turn on the television and watch some sport. Here’s an example. A few years ago a noble judge left in his will that he was leaving his wine cellar to another judge. Bingo! The Press loved it, here was a window into the establishment. Dusty vaults, hundreds of bottles covered in cobwebs, proof of corruption. The bloody establishment. What really happened? The judge went round to his pals house and collected a carboard box filled with a few bottles, some open, which he then shared with other pals and drank the departed’s health. True story. I heard it from the judge, Christ, better watch out or you’ll be thinking I ma part of the edstablishment. Obviously this description is a somewhat ludicrous exaggeration of the way people think, but there is an element of truth in it. There are indeed many powerful people making undeserved, and often negative, decisions in our society but their power often lies in the power of the multinationals, or greed and lack of engagement in community , or the inherent dysfunctionalism of capitalism as a way forward. Lets not use this lazy word “Establishment.” in our fight to get the bastards. They need getting. I’m really enjoying this run of articles. At the time it was closed, Paddy’s Market was serving a new generation of migrants, those new Glaswegians caught in the web of Home Office bureaucracy waiting (8 or more) years for their asylum claims to be heard. Any honest museum of migration would have to make that link with deliberately caused, contemporary suffering so I suspect it won’t ever be created, at least with govt. support. Love it. Great writing. Not entirely sure about the migrants museum idea though, anything with the word heritage attached to it often seems to attempt to fast freeze the joy which usually lessens the taste. Jesus Christ how I hate sectarianism. Twenty odd years ago I had to get some copy set for a full page ad in the Herald raising money for an ecumenical centre on Iona. It was about some marathon runners from all faiths and the copy read ” Tomorrow Rev Tim races Father Billy, whose your money on ?” The first agency refused to do the work and when I threatened to write about them in the blatts, reluctantly agreed and presented me with the camera ready text treble wrapped up in six layers a few hours before copy time Not having a zip up my back I opened it at reception and found they had altered the text from ” some of the money has been raised to All of the money has already been raised. Nice try. I got them to do it again. Same threat though now I had the evidence in hard copy. Anything that can reduce this kind of stone eyed idiocy gets my vote times a million.